Film and Moving Image Studies: Re-Born Digital? It was an honour, and a real pleasure, to be invited to address the 2014 Film Studies Postgraduate Symposium at St. Andrews. I was pleased to hear the students had chosen animation as the theme of this year’s conference, because this is one of my key areas of research interest. The students’ choice reflects a growing interest in animation studies, which is itself perhaps a reflection of the cultural landscape of the moving image. Animation is everywhere. From the devices we carry around in our pockets, to the invisible visual effects in mainstream cinema, there is very little in the realm of today’s moving image that is not created or enhanced by techniques of analogue or digital frame-by-frame construction. Yet this cultural pervasiveness is not reflected in film, media and screen studies education. Particularly at undergraduate level, the study of the history and theory of animation is still marginalised, and on some degree programmes excluded altogether, as an object of study in its own right. One can hope that the balance is slowly being redressed. Current animation scholarship repeatedly draws our attention to animation’s ubiquity. Recent books, articles and edited collections point out the pervasiveness of animation. They do this in part, I think, to emphasise the relevance of their respective contributions to intellectual discourse. But it is also indicative that animation still has to stake its claim in the landscape of film and media studies and animation scholars still feel the need to justify that theirs is a relevant and intellectually worthy pursuit. One thing that makes animation such a rich area of scholarly investigation is not only that it is ubiquitous, but also that it is multifarious in its specificity. The term ‘animation’ includes countless techniques, aesthetics, styles and processes and films from Snow White to The Polar Express, animators from Švankmajer to Aardman. Importantly, animation’s multifarious specificity is distinct from live action cinema. There is certainly a value in making a claim for live-action cinema as a sub-set of animation, rather than the other way around. This is something Sean Cubitt, Lev Manovich and Alan Cholodenko have all argued, in part as a means to assert the validity of animation in the face of the academic marginalisation mentioned above. However, marking out the difference between live action and animation is also important, because to my mind it is in this very difference that much of the power of animation lies. That is, the power to make us look at the screen, rather than through the screen. The power to make us doubly consider what we are seeing by encouraging us to think about the relationship between what is represented and how that representing is taking place. The power to highlight, through its ontological difference to live-action, the process of perception and interpretation involved in viewing the moving image. My interest in animation has most recently been focused on animated documentaries and I think these are a good example of the power of the diverse ontological uniqueness of animation. The contrast of absence and excess underlies the impact of all animated documentary. Absent is the expected live action material of a conventional documentary, material on which documentary’s evidential status is anchored – the fact that what we see on screen is what took place in front of the camera. In its place is animated material, material that through its very nature, or ontology, exceeds the demands of mere representation. Because animation has such a vast array of styles and techniques its specificity becomes something we need to factor in when interpreting the meaning of both what we see on screen and the reality to which it is referring. So animation is an excess. Something that goes beyond merely ‘transcribing reality’ (a quality David Rodowick ascribes to the photographic in The Virtual Life of Film). It is in this tension between, and marriage of, animated documentary’s inherent absence and excess that much of the interesting work, for us, as spectators, takes place. We don’t see what we expect, and what we do see requires additional effort on our part to comprehend within the context of what we hear and what we know about the film’s subject matter. 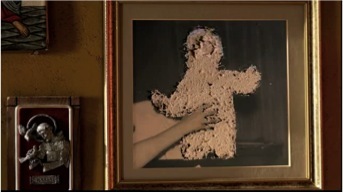 To give one example from the many I could call upon, Afarin Eghbal’s Abuelas (2011) uses various techniques to animate still images, objects, and bodies to tell the story of the grandmothers (or abuelas) of May Square in Argentina and their quest to find the grandchildren born of their pregnant daughters who were disappeared during Videla’s military dictatorship in the 1970s and 80s. The ontology of the film is very opaque, one could initially be forgiven for thinking it is live action as a camera pans around an empty living room. As the film proceeds, its frame-by-frame construction becomes more apparent, for example through pixilation and stop-motion animation. However, viewers to whom I show this film are almost always surprised to learn that it was made entirely using a stills camera. When discussing her creative choices for the film’s animation, Eghbal talks about restricting the action to animated objects and photographs in order to communicate the sense of what the grandmothers have lost. This is certainly the case. We see toys move, as if played with by the hands of an unseen, absent grandchild. And, in a more overt metaphor of what is missing from these elderly women’s lives, figures are etched out of family photographs (see figure 1). However, the animation in Abuelas gains meaning not just through the objects that are animated, objects that Eghbal found in Argentine flea markets, but also through the techniques of animation by which the still image is made to move. There is a kind of metaphoric wish-fulfilment here – the static is made moving to reflect the hope for progression from the stasis of not knowing. But this movement is qualified and not all that it might seem. The way the animation makes meaning in Abuelas is unique from any other animated documentary that uses different animation techniques and processes. 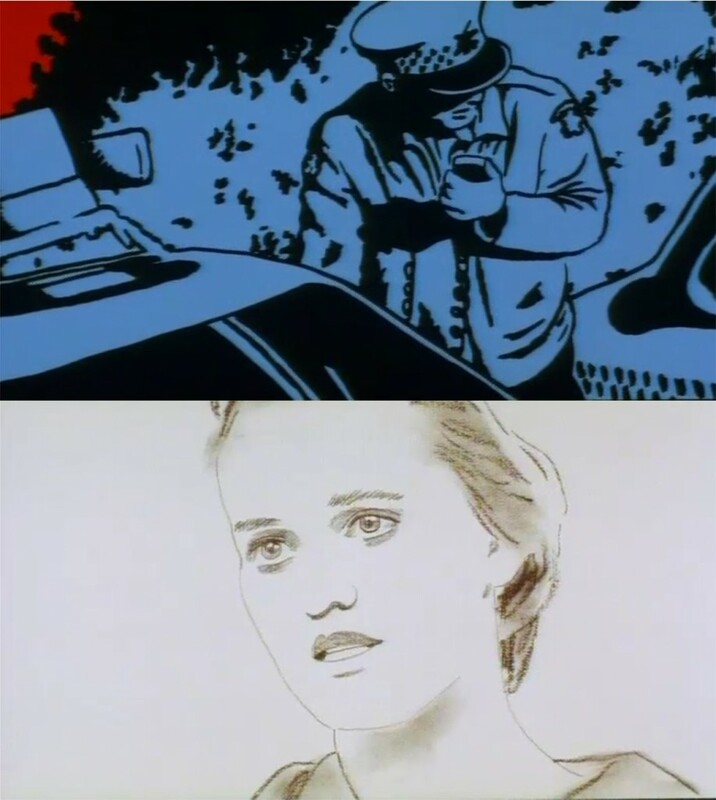 In Dennis Tupicoff’s His Mother’s Voice (1997) a mother’s grief is evoked through the technique of rotoscoping. The ghostly traces of the physical bodies of the rotoscoped actors, who stand in for the documentary subjects, communicate a powerful sense of loss. This works in tandem with two different animation aesthetics to convey different phases in the grieving process, the stark boldness of shock and denial and the later washed out feeling of sadness and absence (see figure 2). To give one more example, Irinka and Sandrinka (Sandrine Stoïanov, 2007) uses animation to weave the animator into collective recollections of her past, via the memories of an aging aunt, in order to counter the absence of continuity with her family history. 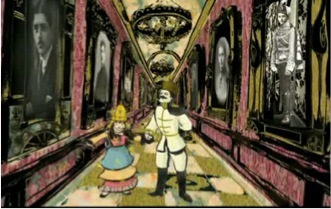 Stoïanov imagines herself as a young Russian aristocrat through a collage-style of animation that layers photographs with images from personal and official archives, along with drawings from children’s books and Stoïanov’s own illustrations. Through a brightly coloured animated canvas that resembles a child’s pop-up book, Stoïanov creates a fantasy world that integrates her aunt’s memories and her own childhood imaginings (see figure 3). The variety of process and styles available to animators makes it challenging to talk about animated documentary in an overarching way. It would be hard to come up with a single ‘theory’ as to how the animation in Abuelas, His Mother’s Voice and Irinka and Sandrinka works, or its relationship with the reality being conveyed. Instead, it is more useful to think about the specifics of what the animation is and how it is constructed, in order to understand its function within a documentary context. The same can be said of animation more broadly and much of the recent wave of excellent animation scholarship does this very thing – focuses on the specificity of animation in order to draw more far-reaching conclusions. This is also the case with the articles included in this edition of the Frames journal, which cover a wide-range of topics with focused attention. Despite the fact that animation is everything and everywhere, and despite the fact that seemingly all moving image culture owes something to the techniques and technologies of animation, moving image studies education is slow to catch up. However, we can hope that the work being done currently in animation studies scholarship, and the interest shown by postgraduate research students, such as those at St. Andrews, is a sign that things are beginning to turn in the right direction.